Banshee, Tomboy And Mono Dropped from Ubuntu 12.04 CD - OMG! Ubuntu! 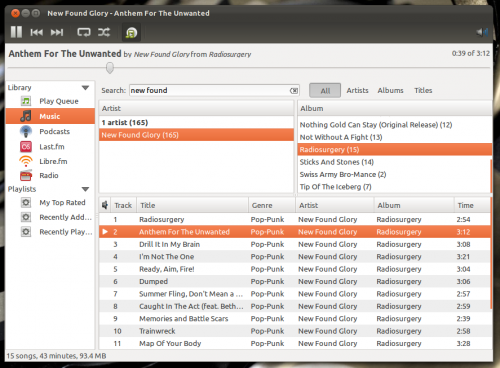 Banshee will be replaced by Rhythmbox for Ubuntu 12.04. The news was confirmed during the wrap-up session of the Ubuntu Developer Summit. But Banshee is not the only removal: note-taking application Tomboy is also to be removed from the default application set on the CD. Both applications will remain easily installable from the Ubuntu Software Centre for those who prefer to use them. Tomboy and Banshee both relied on the ‘mono’ framework. As this is no longer needed “out of the box”, it too will be removed form the default CD. Inklings towards the removal of Banshee were felt at the�Default Apps Session earlier this week, where a strong case was made for the return of Rhythmbox. Happy with the decision? Going to miss Banshee or Tomboy?